BOO! 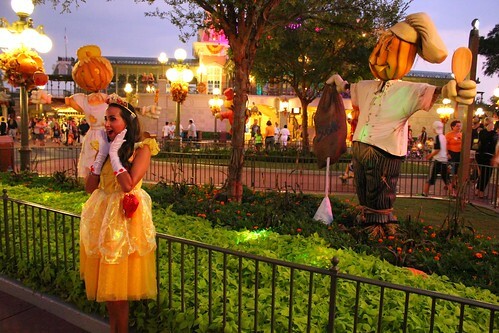 Boo to you, that is, from Mickey’s Not-So-Scary Halloween Party, the annual after-hours event that takes place on select nights in September and October in Walt Disney World’s Magic Kingdom. Filled with parades, fireworks, shows, dressed-up characters, eerie music, and lots of trick-or-treating, it’s the ultimate Halloween event in Central Florida for those not interested in getting any scares. 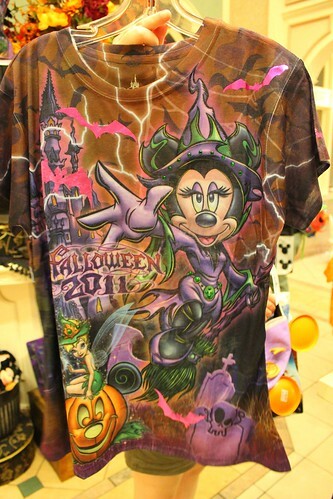 Disney has been putting on essentially the same successful party year after year, but in 2011, a few notable changes have made their way into Mickey’s haunted happening alongside a host of spooky sights and sounds. 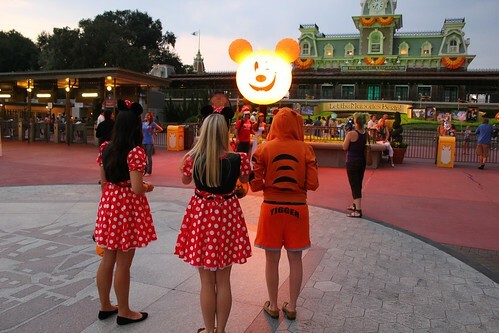 Arriving to Mickey’s Not-So-Scary Halloween Party, it’s immediately clear that this is truly a happy Halloween, with plenty of smiling faces, from cast members and costumed guests alike. Despite the foreboding Haunted Mansion organ music piped in from regions beyond, the Magic Kingdom party at Halloween time always feels upbeat with a certain excitement filling the air. 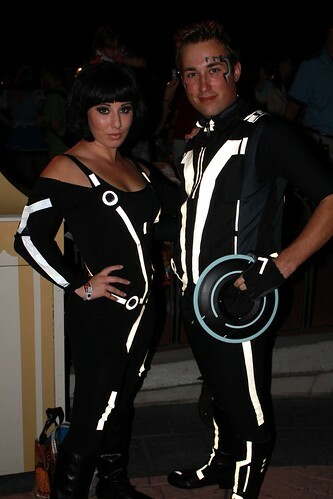 It’s easy to get lost bouncing through the seemingly endless stream of entertainment that Disney packs into this Halloween Party. Not long after the event begins at 7pm, the first Villains Mix and Mingle show hits the Cinderella Castle stage, drawing its biggest crowd of the night. It’s an attention grabber filled with bright costumes, familiar characters, and catchy music. It’s tempting to head directly to this stage to catch the show, but not necessary, as it’s performed three more times throughout the night. 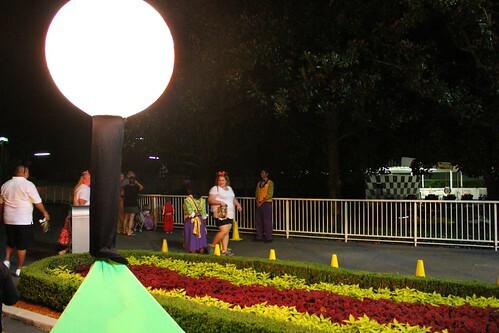 While the masses are huddling around the Hub and in front of the castle stage early in the night, it’s a good time to explore outward in search of candy and other characters. But eventually, all party attendees should make time to watch the Villains Mix and Mingle, as well as take part in the “mingling” afterward. The show itself this year has undergone a drastic makeover. 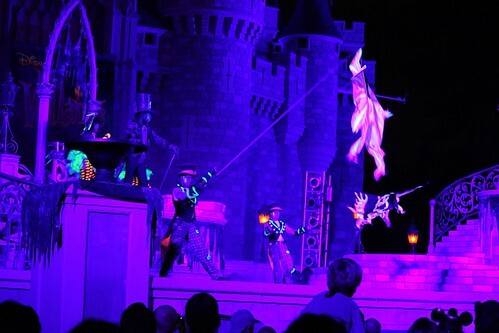 Beyond the opening earworm, “It’s Halloween-Lo-Ween,” the rest of the performance has been changed, replacing recent years’ fishnet-clad dancers dancing surprisingly suggestively with energetic, brightly-clothed dancers, followed by a flurry of Disney villains. 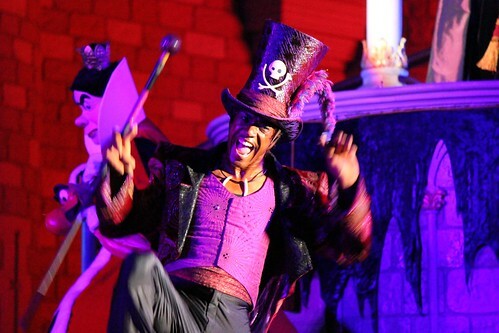 A good portion of the show is now dedicated to showcasing Dr. Facilier, the villain from “The Princess and the Frog,” who is rarely seen in the parks. His performance of “Friends On the Other Side” is a highlight of the show, if not the whole night. As Facilier calls out to his “friends” and “transformation central” descends upon the Magic Kingdom, Cinderella Castle is bathed in blacklight and spirits emerge. This all-new song and dance routine is a must-see. In fact, you can see it right now in the video below, though it ought to be seen in person to be totally appreciated. The rest of the show features appearances from Maleficent, the Queen of Hearts, Jafar, Frollo (yeah, the guy from “The Hunchback of Notre Dame”), Captain Hook, the Evil Queen from “Snow White,” and Cruella de Vil, each with their own brief moments on stage. Accompanied by a song inherited from Tokyo Disneyland, the second half of the new Villains Mix and Mingle show is rather forgettable, capping off with a bizarre “Glee”-inspired finale. Want to see the whole show? Watch below. 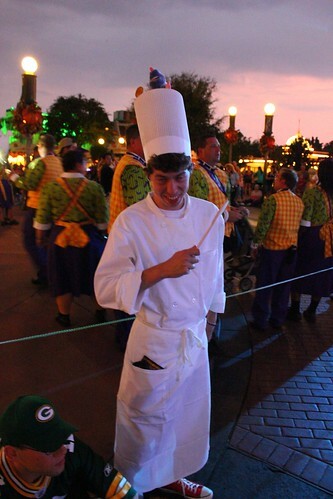 The best treat comes after these stage show tricks when all of the villains come down for meet-and-greets with guests. And here’s where the most important tip for the night is offered. 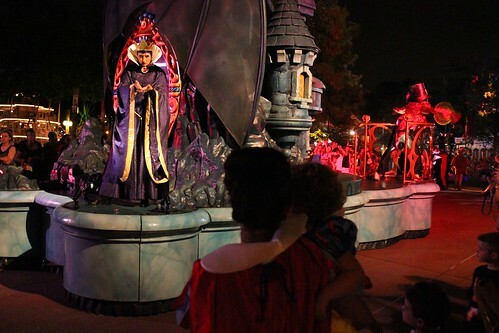 The villains are only out for a short while, roughly 15 minutes, after each show. With lines forming quickly in front of each one, it can be tough, and possibly frustrating, to get a photo. The lines move fairly rapidly as no autographs are allowed here, but even so it’s likely there’s only enough time for one or two, at most, villain meetings. 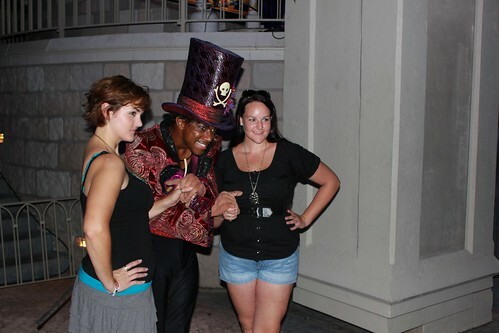 Fortunately, the villains emerge in the same spots after each show, allowing guests to plan ahead where to stand as the Villains Mix and Mingle comes to an end, ready in prime position to get a quick photo with a favorite character. 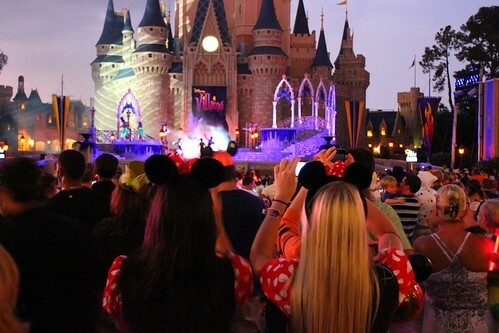 The order, starting from the ramp to the left of Cinderella Castle and moving across the front of the stage to the right-side ramp, is as follows: Maleficent, Dr. Facilier, Evil Queen, Captain Hook, and the Queen of Hearts. Frollo hangs around the castle side of the Hub while Jafar is on the backside of the Hub, closer to Main Street. Cruella runs off to the right side of the Hub. Choosing one of these spots before the villains arrive will offer the best chance at a photo and avoiding disappointment. 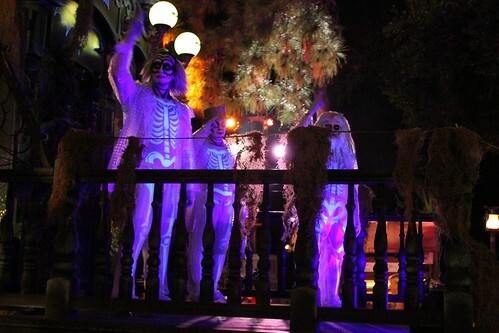 Entertainment continues throughout the streets of Mickey’s Not-So-Scary Halloween Party. 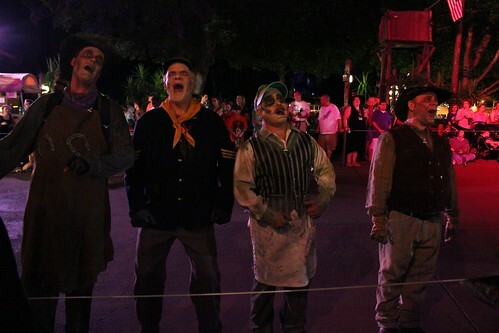 Not scheduled on the event map, the Cadaver Dans appear in Frontierland and Liberty Square periodically, singing spooky and not-so-spooky songs, often with a comedic twist. 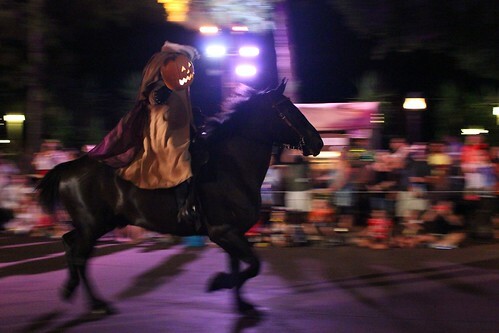 Prior to each Boo To You parade (of which there are two of each night), the Headless Horseman rides down the parade route, beginning near Splash Mountain, winding through Frontierland and Liberty Square, ending down Main Street where he exists in Town Square. This year, the Horseman seems to move at a slow trot, rather than a gallop, allowing guests a better glimpse and a great photo opportunity. The Boo To You parade is one of Disney’s finest, packed with commonly-seen characters in new costumes (celebrating Halloween) and plenty of characters rolled out just for the occasion. A good tip for optimal parade watching (and picture taking) is to look where lighting rigs are pointed before the parade arrives. The areas of the streets that are most lit up will offer the best views of the parade floats and characters (and least blurry photos). It also helps to attend the second parade of the night, as fewer crowds watch then. This year, the parade features a few changes, beginning with a new opening float sign. Further down the line, Angelica now stands on the Pirates of the Caribbean float, relinquishing Barbossa to walk ahead on foot. 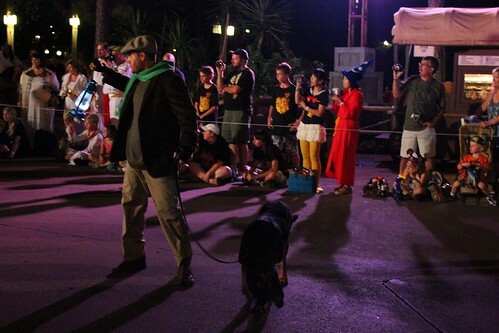 The fan favorite Haunted Mansion section still features some of the attraction’s most memorable characters come-to-life, including the caretaker and his dog along with the famous hitchhiking ghosts. As with the Villains Mix and Mingle show, Dr. Facilier is also a new addition to the Villains float this year, hamming it up on the front right side. The Boo To You parade ends with candy handed out, but it’s certainly not the only place to get candy during Mickey’s Not-So-Scary Halloween Party. Candy stations are set up throughout the park, so it’s best to check the map and make a plan while wandering through the lands. It can be tiring to have to retread paths just to hit a new candy spot. 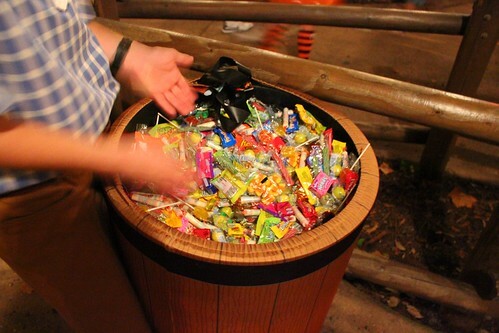 One of the best is the new treat trail winding through the Splash Mountain queue, offering a series of candy stops, one after another. 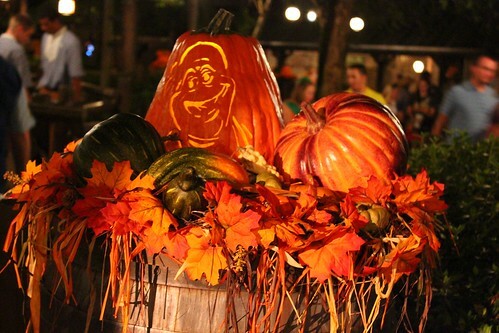 The trail is lined with Jack-O-Lanterns themed to the attraction. Some candy stops have fun themes, like the one next to the Tomorrowland Indy Speedway, requiring guests to walk around a mini “race course” lined with cones in order to get the candy. 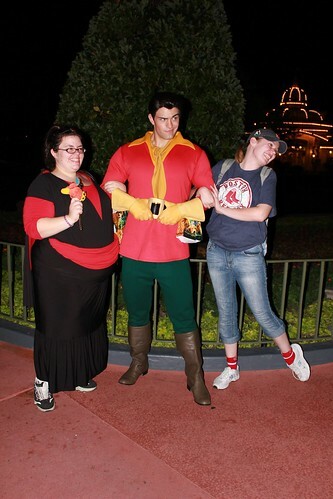 We’ll likely see more of him when the Beauty and the Beast section of the New Fantasyland expansion opens, which will include Gaston’s Tavern. 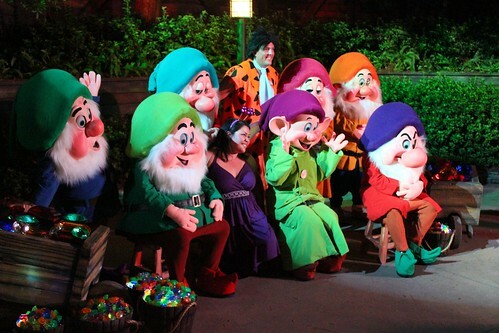 Other characters spotted in the park include Captain Jack Sparrow, Lots-o-Huggin’ Bear, Rafiki, and Buzz Lightyear. Meet-and-greet locations are notated on the event map. 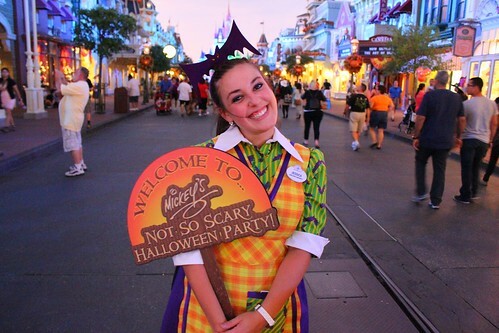 While not required, guests of all ages show up to Mickey’s Not-So-Scary Halloween Party in costume, taking pictures on their own or with characters throughout the night. 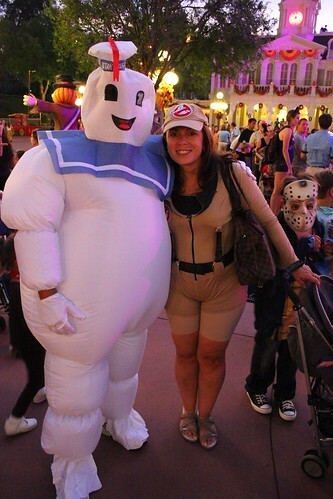 It’s fun for all guests to see what other guests have shown up as. Below are a few favorites that I spotted. 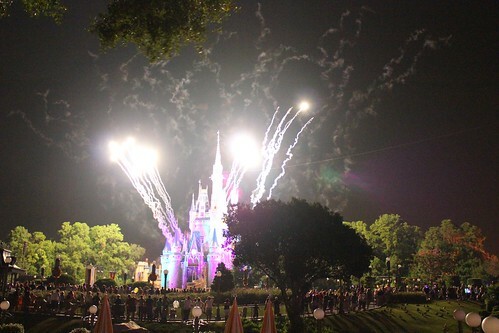 Not new this year but still a highlight is the Happy HalloWishes fireworks show, best viewed from Main Street or in front of Cinderella Castle, but still enjoyable from almost anywhere in the area. 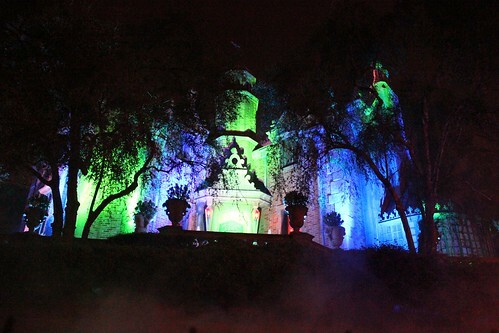 The Haunted Mansion is also a must-visit during the party, specially lit up for the night. 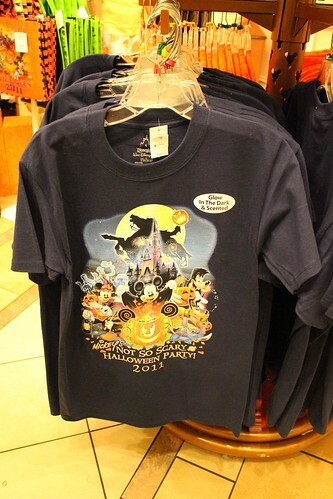 And, of course, plenty of special Halloween merchandise is available to make the memories last after the night is over, from placements to glow-in-the-dark scented T-shirts (smelled like marshmallows…?). 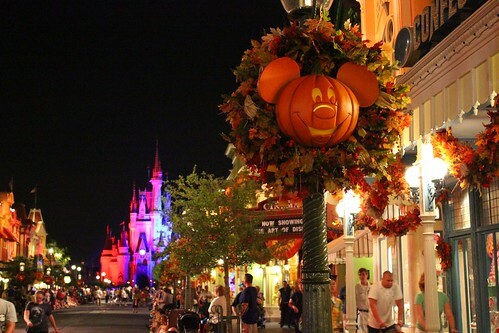 The 2011 Mickey’s Not-So-Scary Halloween Party is a separately-ticketed event, taking place on the following remaining nights at the Magic Kingdom: September 20, 23, 27, 30; October: 2, 6, 7, 10, 11, 13, 16, 18, 20, 21, 23, 25, 27, 28, 30, 31; and November 1. 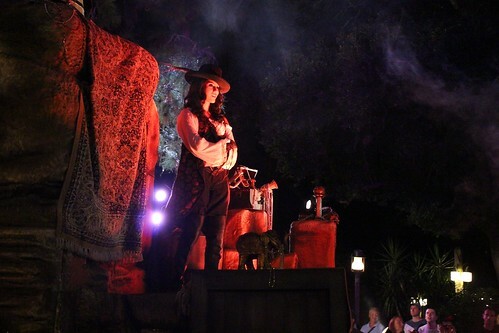 Each night’s entertainment begins at 7:00 pm, with the park open until midnight, though character experiences end at 11:30 pm. 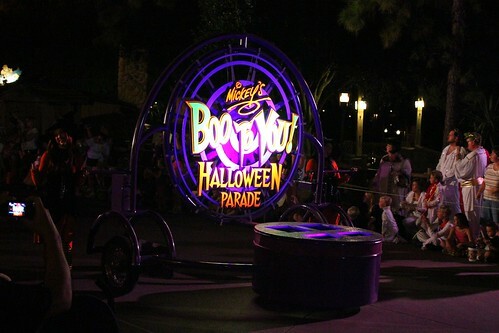 The Boo To You Parade performs at 8:15 pm and 10:30 pm, with the Happy HalloWishes fireworks show at 9:30 pm. Ticket prices start at $53.95 for adults and $47.95 for children ages 3-9, ranging up to $72.37 for adults and $67.05 ages 3-9, depending on date and available discounts. 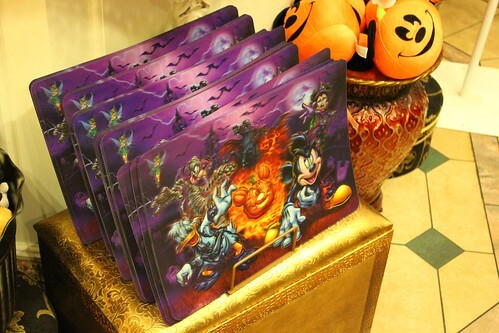 More information, including how to buy tickets, can be found at the official Mickey’s Not-So-Scary Halloween Party web site. 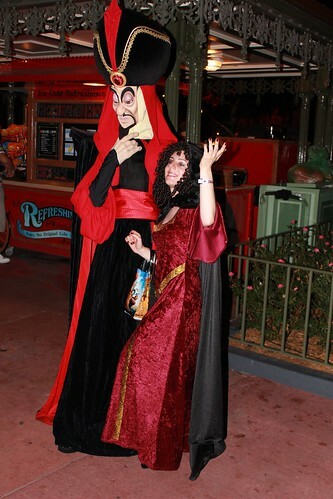 What’s so odd about Frollo appearing for meet-and-greets? He was regularly featured for years in the Disney Stars and Motor Cars parade at the Studios, and still appears in Fantasmic! over there. I think he’s a fantastic villain, I’m glad to see a little love for The Hunchback of Notre Dame. It’s also great to see Facilier and Gaston in the parks. 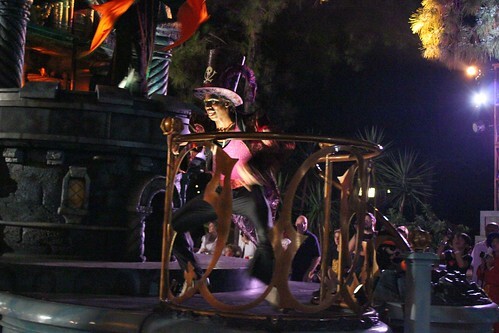 I think the coolest part about the Haunted Mansion portion of the parade is how the ghost characters (dancers, Hitchiking Ghosts) dance and act like Audio Animatronics, with their stop-motion actions and acting like the characters they play from the ride. I didn’t notice it last year, but watching the video this year I did see it! to Characters The Villains Donald Duck Maleficent The Evil Queen ? Dear Disney Characters Princess Esmeralda And Copin Good Night Day Hi Princess Show White and Prince Aladdin Genie Princess Belle Price Baest How are you . I’ m Fine. Hello is Nicholas Gist What ‘ up? doing I have new your my friends All the They My friends Disney Characters Many have his fiends From Mickey Mouse Goofy Donald to son Nicholas Gist Can I me Nicholas Gist Try Please @ Disneyland why for Halloween Party to They The Villains Gaston Witch Queen The Villains . The Villains Donald Duck ? Yes or no please why for Kids Children watch to son Nicholas Gist @ Disneyland and Disney On Ice World Arena Colorado Sprigs Co, Blvd North. to Characters Princess Esmeralda And Colpin Megara Anna Elsa Merida Mulan Pocahontas Alice Mad Mary Bert Wendy Peter Pan Tinker Bell Blue Fairy Godmother Fairy Jane Hercules Cinderella Ariel Aurora Tiana Rapunzel ? With to They Chap and Dale Nicholas Gist @ Disney On Ice 100 years of Magic When Wish You Upon A Star and Stars Donald Chap Dale Nicholas Gist Donald Minnie Mickey ? and Disney On Ice Disneyland Adventure Dancing Party from Pixar and in Parade Nicholas Gist . Characters Parade From The Villains Maleficent ?